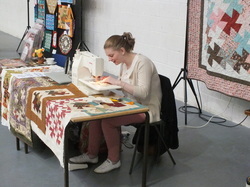 Our exhibition was held at Collingwood School in Camberley Surrey over the weekend of April 21st and 22nd . Challenges were set, quilts were gathered up, tombola bags were made, the mayor was invited and cakes baked. All was ready to have a wonderful weekend. 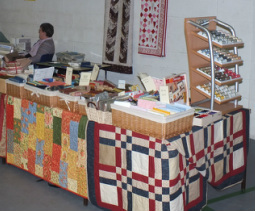 Quilts from the Early Years of Heather Quilters were also on display. 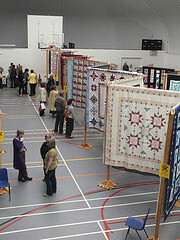 Click to view the 2012 Exhibition quilts and the Early Years. 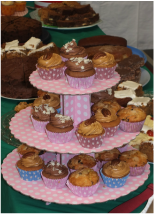 A wonderful choice of cakes to delight visitors, traders and Heather Quilters. 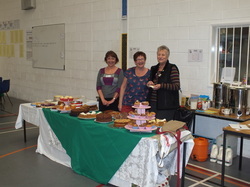 Sandy, Netty and Mabel kept everyone supplied with refreshments all weekend. Plus a team of washer-ups of course.